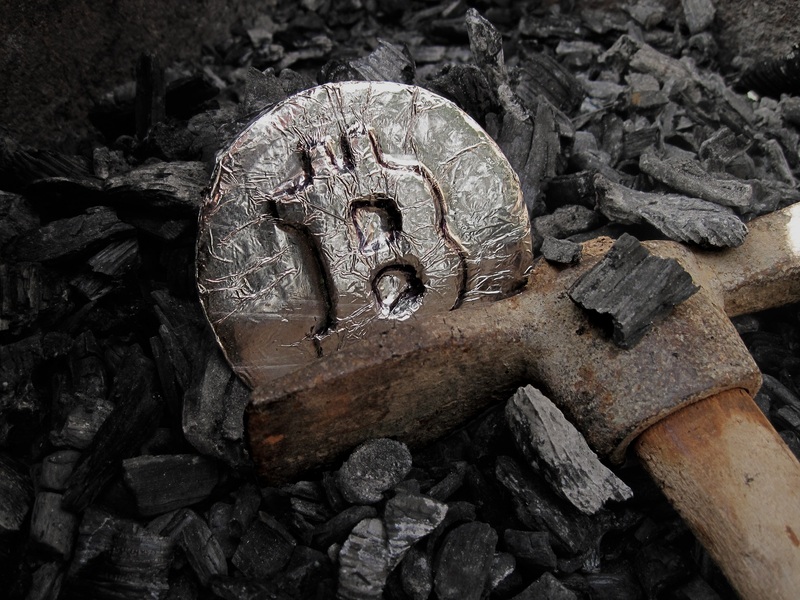 We all know Trump “digs coal.” But did you know that bitcoin digs coal, too? It turns out that this cyberspace asset is responsible for increasing levels of greenhouse gases. And China’s bitcoin miners are the worst offenders. Fifty-eight percent of the world’s bitcoin miners operate in China. In Northern China, Bitmain Technologies Ltd. has a server farm. Eight metal warehouses hold 25,000 computers that do nothing but mine bitcoins. And the power they use is generated at a plant that runs on coal. The more bitcoin that is created, the more power that is required. It’s used to run computers that solve complex “proof of work” algorithms to verify bitcoin transactions. A lot of miners in China are getting their power from coal-fired power plants. That’s because 72.6% of all the electricity produced in China comes from coal-fired power plants. The good news is not all bitcoin miners use dirty power. Genesis Mining is based in Iceland. It uses geothermal power instead of coal. It too has more than 25,000 computers at its mining complex located just outside of Reykjavik. More good news: Power produced from coal in China is falling rapidly. Just 10 years ago, in 2007, China got 80.9% of its power from coal. So its reliance on coal has dropped almost 10% over the last decade. But even with China’s coal plant reduction and use of clean power elsewhere, bitcoin still comes up dirty. And it’s only going to get worse from here. That’s because the amount of power needed to run bitcoin’s algorithm-crunching computers is skyrocketing. If the network continues to grow at present rates, these computers will consume all of the available electricity in the world in just three years. You see, the miners generate more bitcoin every time they verify a transaction. They are paid to confirm the transaction in an online ledger known as a blockchain. And a new transaction is added to the blockchain about every 10 minutes. All of the computers run the same software independently. That’s why they don’t have to trust each other. They just trust the software they’re running. Transactions become valid when enough miners agree on the same transaction history. All these computers are necessary because complex mathematical puzzles are used to protect the transactions. The network is designed so that the more mining computers that join the network, the more complex the problems become. The continuous cycle of mining and the potential to receive bitcoin as a result of confirming a transaction incentivizes people all over the world to mine bitcoin. As the price goes up and more mining computers join the network, the power required continues to climb. 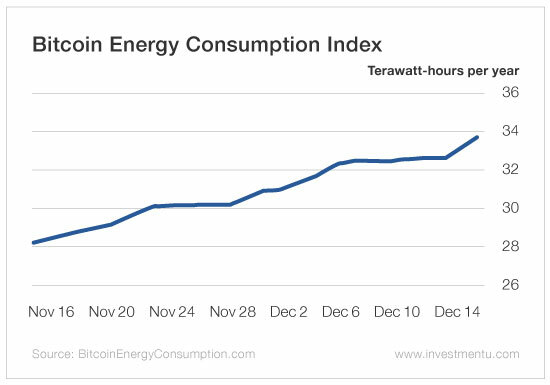 According to the Bitcoin Energy Consumption Index, the current estimated energy consumption by bitcoin miners is 33.73 terawatt-hours, annually. As you can see from the chart, its rate of increase has been incredible in just the last month. But miners say it’s worth it. Estimated annual global mining revenues are now a cool $17.7 billion. However, besides the cost of the computers themselves, the next biggest expense for a bitcoin miner is electric power. That’s why they look for the cheapest power they can find. In China, that means coal-fired power plants. They produce the cheapest power available. Unfortunately, they also happen to be the dirtiest. That’s giving bitcoin miners a very dirty carbon footprint. Mining bitcoin now produces an estimated 16,530 kilotons of CO2. Every time a bitcoin transaction is verified, 117 kilograms of CO2 are generated. Clearly, from a power-using and pollution-generating standpoint, the current bitcoin transaction verification system is unsustainable. Something has to change. Fortunately, there are far better alternatives coming. The proof of work algorithm isn’t the only consensus algorithm available. Developers are working on “proof of stake” algorithms for other cryptocurrencies. Instead of being run by a huge network, they are run by individual coin owners. They generate the blocks that add to the blockchain without the need for industrial-grade mining hardware. Therefore, the amount of computing power is greatly reduced. More work is needed, however. The absolute reliability of proof of stake algorithms has yet to be proven. Let’s hope alternatives are found and put in place soon. The health of our planet depends on it. Editor’s Note: As Dave said, developers around the world are working to improve blockchain technology and fix bitcoin’s flaws. In the process, they’re creating brand-new cryptocurrencies - some of which could become more valuable than bitcoin is today. Our colleagues at Early Investing LLC have just launched a research service focused on these alternative cryptocurrencies - and they want to get you in on the gains. Click here to learn more. Dave is quite knowledgeable about bitcoin mining - but his real area of expertise is in old-school physical resource mining. As his Advanced Energy Strategist subscribers know, Dave is quite bullish on cobalt - a scarce metal with a variety of important applications. One of his most profitable recent recommendations is eCobalt Solutions Inc. (OTC: ECSIF). Since adding it to our portfolio back in October 2016, our shares are up a very healthy 131%. Last week, the company provided yet another update on its Idaho Cobalt Project (ICP). The company is making significant progress on optimizing the capital costs associated with the ICP. The company has determined that China is going to be a big factor in reducing cost and increasing battery production capacity. This has reduced the premium potential customers will pay for cobalt sulfate versus cobalt metal itself. As a result, the company is planning to deliver clean cobalt concentrate. This will reduce the technical risks of the ICP. It will also keep profits and cash flows at higher levels. This means its cobalt production facility will be a much simpler design and, more importantly, lower in cost to construct. Its clean cobalt concentrate will be sold to battery manufacturers that will use it in the manufacture of battery cathodes for lithium-ion batteries. This is a great example of a junior miner moving up on news. When they move, they tend to move big. There’s plenty more upside ahead for this cobalt miner.